Palo Alto, CA (PRWEB) June 03, 2014 — Marketers know that a major challenge facing their bottom lines these days is making marketing work efficiently for them, in particular social media marketing. With 49% unable to quantify whether social media has made a difference to their companies, according to a Duke University CMO Survey, many are beginning to laud the emergence of advanced influencer outreach platforms, such as ssnapp from Social Media Gateways. 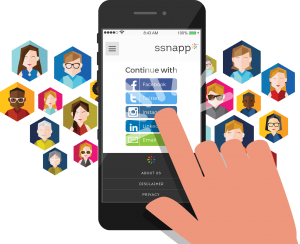 Brands in need of vertically integrated social promotion tools are increasingly turning to ssnapp 1.9, the latest version of Social Media Gateways’ social marketing automation platform. What makes this iteration of ssnapp so attractive to marketers like Pepsi, HP, OfficeMax, the Philadelphia Flyers, and other blue-chip brands, is its analytics engine that lets marketers visualize engagements with digital influencers, amplified by the added dimension of gamification. “Brands are utilizing ssnapp’s social engagement automation and intelligence system to boost their consumer engagement and increase their marketing ROI,” notes Social Media Gateways Founder and CEO Moses Kusasira.